For us in the South the propane furnace. We use it maybe twice per year and then only for a quick 5 minute warmup. A 110 volt electric heater keeps us warm down to the low 30's. We use propane for frying a couple of eggs in the morning but charcoal at lunch and dinner. So the propane tank is the 2nd least used. The stupid vanity table/mirror with the stage lighting. 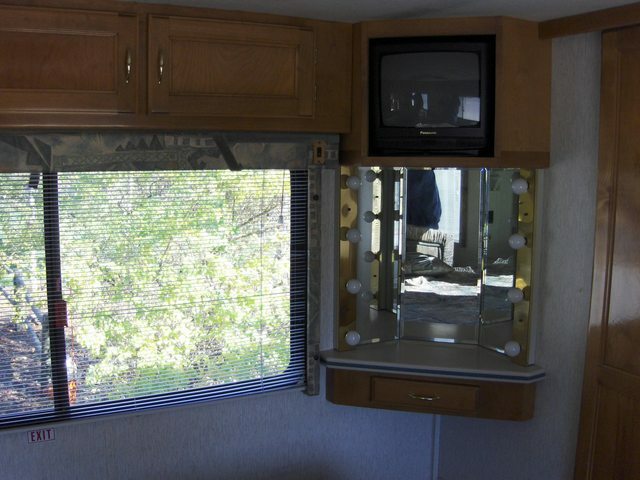 When we looked at the motor home before buying it, the DW sat on the corner of the bed, turned on the lights and said "Look, I'm a star!". That was the only time we used it. The Barker tote tank I bought when we stayed a week at a CG with only water/electric. I've used it just that one time in 6 years. First-aid kit. Road-side emergency kit. Knocks on wood. Couple plastic basins that have never been used except to hold some stuff in storage below the bench. Couple electric adapters and a set of wheel bearings along to ensure I never have that issue either. The Magic Chef propane oven below my range top is 19 years old. It's never been used. I turn it on every couple of months just to be sure that it works. It does. Have to agree with original poster, my Genturri gets very little use. I will sometimes bring a small inverter generator with me that generally doesn't move out of the compartment. Just to be different, I love my TV's and yet, I can still spend enough time outside to meet and greet the whole neighborhood! Funny how that works!! Oven, except it’s a great bread box. Grey Tote every now and then at state parks. Generator. More time used in “Exercising” than real duty. But has come in handy to run while setting up. Stand Alone Ice Maker, prefer to bring ice from home or just go get a bag. All the extra dishes, glasses, coffee cups that we have on hand “Just in case”. Does it have to be just one thing. Because like some others. We NEVER cook inside, and to only time the stove is lite is to bleed the gas out of the lines for the fridge. and of course the furnace. We use a oil filled radiator. And we do use the awning tie downs. at the beach you need them all the time. Keeps the awning from shaking the TT. If the wind gets really up, like the hurricane a few years ago. We take the awning in. Other than that. The awning stays out and we only watch TV enough to get the weather. One other thing would be the DVD player. Never had a DVD in it since I installed it. My Coleman lantern. I like the darkness. Hard to use built-in vac with long hose you get in a wrestling match with or maybe it's that silly remote control for the awning, slides, jacks and I don't know what else. Never used it.